The symbol on Michael’s breast represents our four-square connection to reality, centered by the triangle of divinity. This also is the symbol of Tarot. The two symbols together resonate to the number seven, a number of divinity, mysticism and completion. This symbol also resonates to the seven major chakra centers in the body. Michael stands, as do several other figures in other Keys, with one foot on land, representing connection to the conscious world, and one foot in the waters of the unconscious. The irises at the water’s edge remind us of the Egyptian goddess Isis and the promise of the rainbow. The path behind Michael leads to the crown of mystery and attainment of spiritual knowledge. Michael will always protect you if you ask! In The Fool’s journey toward enlightenment, his/her path carries him/her through the balance of yin/yang, subconscious/conscious, and so many other mysteries of finding balance in his/her life. 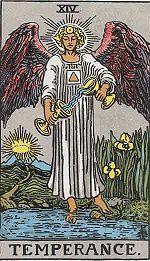 The Temperance Key is about trusting the process, being attuned to the gifts of the Universe, and treading lightly through the balance of every day.